Tokyo Gov. 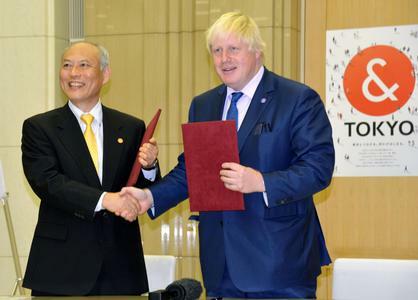 Yoichi Masuzoe and London Mayor Boris Johnson signed a friendship agreement between their cities on Wednesday. Under the pact, Tokyo and London will deepen cooperation in six fields, including culture and tourism. They will consult each other on two major sports tournaments, the 2020 Tokyo Olympics and the 2019 Rugby World Cup, which Japan will host. London is Tokyo’s 12th friendship city partner. Others include New York, Beijing and Paris. It last signed such an agreement with Rome in 1996. Speaking at a news conference in Tokyo after signing the agreement with Johnson, Masuzoe said he wants to ensure the success of the Tokyo Olympics by learning from London’s experience in 2012. He said he would study London’s legacy — a term that refers to the further use of infrastructure built for the event once it has ended. A bureau within the Tokyo Metropolitan Government preparing for the hosting of the 2020 Olympics and Paralympics will meet with officials of the London Legacy Development Corp., chaired by Johnson himself, said metropolitan government official Shinichi Kawanago. The exchange would help inform Tokyo’s planning for the event and its legacy use.